Originally designated the F9F-9, as a Cougar variant, the Tiger was redesignated the F-11F-1 and developed as an entirely new aircraft. The F-11 was the first aircraft to use the NACA-developed "area rule" concept from design inception. This concept, more familiarly known as the "coke bottle" shaped fuselage, greatly reduced drag. This was also the first carrier based fighter with supersonic capability, due to the specially shaped fuselage, powerful engine and very thin wings fitted into the most compact airframe possible. F-11's were armed with four 20mm cannons and four Sidewinder air-to-air missiles. The Grumman attributes of simplicity and ruggedness were stressed in the design of the Tiger. The top and bottom wing skins were machine milled from single slabs of aluminum, greatly reducing the number of parts, time and expense usually involved in complex wing assembly. The wings also served as integral fuel tanks. Another unusual feature of the Tiger was the use of spoilers instead of ailerons for bank and roll. This permitted flaps which extended the full length of the wing trailing edge. First flown in July, 1954, deliveries of production aircraft began with assignment to VA-156, a fighter/attack squadron in 1957. Production continued through December 1958, the last of 201 built was delivered in 1959. Five first-line squadrons were equipped with the Tiger, and for a period this was the Navy's fastest shipboard fighter. The Tiger's main drawback was its limited range due to high fuel consumption and the lack of external fuel tanks. The Navy's Blue Angels aerobatic team used Tigers for more than ten years. Two Tigers were modified with a 15,000 lb thrust J79 engine and in 1956 one set a new world speed record of 1220 mph (Mach 1.85) and a new world altitude record of more than 76,000 feet. This aircraft was obtained from the Naval Test Center at Patuxent River, Maryland. 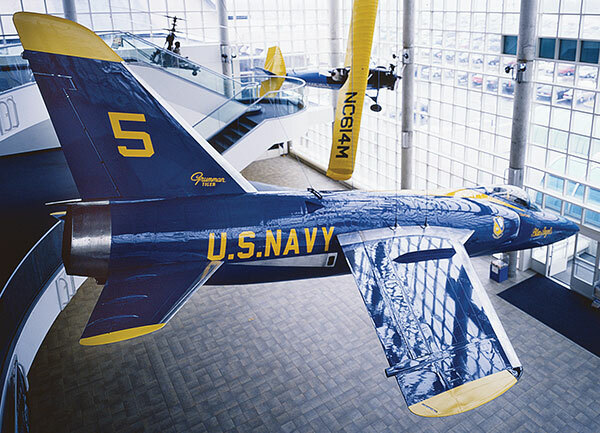 It was restored by the Grumman Retiree Group, and is now in the markings of Captain Norm Gandia, a Long Islander from Baldwin and one time Blue Angels pilot.